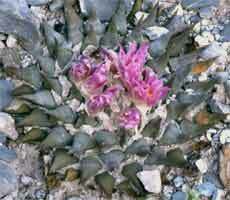 A. retusus LRM315, a large flowering plant. 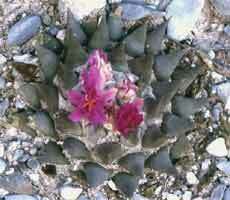 A. retusus LRM315, the pink flower color is very uniform in this population. The plants at this location appear to have more uniformly sharply conical pointed tubercles than those seen at other locations in the Aramberri area and, admittedly based on the small sample seen in flower, they had the highest proportion of plants with deep pink flowers, no white flowering plants were observed. The plants grow on the southerly to westerly lower slopes of larger limestone hills.